Because commercial and residential solar panels rapidly become dirty and dusty, it is important to clean them on a regular basis. However, before cleaning your solar panels, a certain amount of planning is necessary. If you are not confident enough about walking around on a high rooftop or around a solar panel array, it may be best to employ a solar panel cleaningexpert instead. The first thing to do is to determine the order of how you want to wash the panels. Heliotex recommends starting at the top and working your way down. Before cleaning your solar panels, amass the tools needed for the job. You will want to attach a hose featuring a spray nozzle to a water connection point, most likely located on the ground. Put the correct amount of soap concentrate in a bucket before you go up on the roof, and remember to fill the bucket with water using the hose while you are up there; filling the bucket up while you are still at ground level means then having to carry a heavier bucket up the ladder. Consider using safety ropes or a harness if you are on a roof with a steep pitch. If you see a loose electrical connection on one of the panels, or if you accidentally pull a connection loose while cleaning, contact your solar electric integrator immediately. Do not attempt to fix the damage yourself. Your cleaning pad should be in good condition, so it will not inadvertently scratch the solar panel's glass surface. Be careful how you walk on the roof, especially if it is old or made from tile. The most popular solar panel cleaningtime is early in the morning because you will avoid the panels heating up and the soap prematurely drying and leaving streaks. Clean your solar panels using this straightforward six-part method. Fill the bucket with water to achieve the correct mix level with your soap concentrate, making sure that you do not use a harsh detergent or one that has a color or odor (cleaning products with colors and/or odors leave an unsightly film on the panel). Carefully wet down the solar panels with the hose, then dip the cleaning pad into the bucket and clean each panel individually. Do not allow the soap to dry on the panels. By only cleaning a small section at a time, you are able to rinse the soap off before it dries. Be careful not to snag the fastening bolts when running the pad over the glass, and do not spray water under the panels or directly onto the electrical connection boxes. Clean each panel from top to bottom. When you are finished, use a squeegee to remove any remaining water. IMPORTANT: Make sure you remove all water if you live in a hard water area, since hard water metals like magnesium and calcium will end up spotting the panels as they dry. Quickly inspect the roof to make certain that you have not broken any tiles or cracked any roofing, etc. If you have, call a professional contractor to repair the damage. When all of your solar panels are clean, safely remove all materials from the rooftop and secure the ladder. 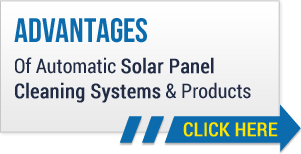 If you have trouble finding solar panel cleaning products that will not damage the environment or void your warranties, please contact us today. Heliotex sells a safe soap concentrate that can be diluted for manual use, and it also works well on windows too! How often you clean your solar panels will be determined by how quickly they become dirty in your local area. However, the general rule of thumb is, the more frequently they are cleaned, the better your overall energy production will be.